Although both Taichi and Chihaya are gone, Kana remains determined that they will not lose face as the reigning team champions. The club takes up Tamura’s suggestion that their win-loss record over the following month would be used as a reference to help determine the team for the Tokyo regionals, and each of the second and third years reflects in their own way on the situation. Nishida is determined to put Tamura in her place, whilst Tsukuba, as always, aims to become the team’s Ace. Sumire wonders how the regionals will turn out, and Komano decides to put off his confession to Kana until they’ve overcome this crisis. (Though he may also be doing it because he’s afraid of confessing…). Go and learn. Anything at all, just go and learn. Back in the classroom, Chihaya continues to study hard with Michiru. Her popularity soars as her male classmates appreciate the studious figure she now cuts…until they realise that she’s burying herself in study just as she once did with karuta. 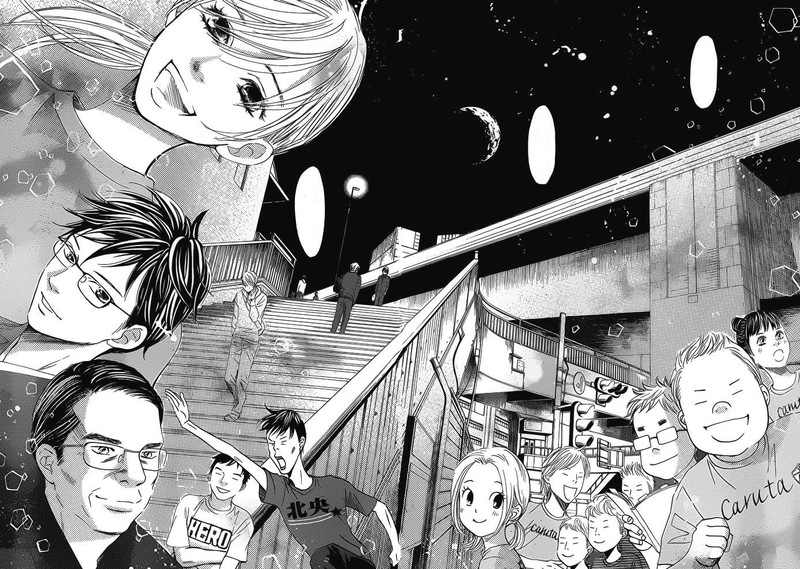 But even then, her fellow club members—especially Taichi—are never far from her mind. I’ve stopped playing karuta. Who could ever have imagined that such a day would come? I’m good at everything I do, so I got into Tokyo Uni without even going to cram school. But on the flip side, I can’t say that ‘the days of youth’ ever came my way. Well…let me throw that “Hah-!” right back at you. (Students: WHAT!?) But one day, I realised that in the kanji for “youth” (青春), the kanji for “time” (月日) can be found. A sudden regret about “the days of youth” arose in my heart, and I started looking for them within myself. In this class, I’ll be teaching you how best to gather marks in the short essay section of your exams. But on top of that, I want you to remember this one thing: that words hold great power. Words certainly have power… the power…of a curse. I don’t love karuta… But if I acknowledge that, I can’t be by their side. You must really have loved those people, if you managed to stay there even though you don’t love karuta itself. But what’s wrong with that? After all, I don’t love karuta either. It’s still unclear how the Mizusawa Karuta Club will fair in the upcoming Tokyo regional. Though Nishida and Kana are fired up, it seems like several members largely playing for their own glory rather than for the team… There are vibes of what happened in their first regional tournament, but is the team going to be able to come together this time? Pardon me for skimming over this part though: I’ll have a lot more to say about this when I’m able to read chapter 142 for myself. On to the meatier part of the chapter. Taichi’s conversation with Suou reminded me of a big debate that fans on Animesuki first went into during the first season of the anime and repeated as the second season aired: why does Taichi actually play karuta? Looking quickly back over those discussions, the Taichi fans were adamant that he loves karuta in his own way, whilst Taichi detractors argued that he was only playing for Chihaya. I must admit that I didn’t expect this debate to become so explicitly relevant, but now, it’s quite amusing looking back on some of the arguments that fans were making back then. The same thing goes to who Chihaya likes? Taichi detractors keep saying Arata, but Taichi fans were in denied. Taichi might have learn to like it a bit, but if he really like karuta, he shouldn’t leave the club because of Chihaya, like he only is there because of her. Let’s not touch on that shipping debate… and if you’re not going to engage with the serious arguments about why Taichi left the club, then I’m not going to engage with what you say either. There is a key difference between Taichi and Suou, which is that Taichi has always played karuta because it’s the people in it that he likes. Suou never even had that. And with Suou having become eternal Meijin, Suetsugu already seems to have indicated that ‘it doesn’t matter whether you actually love the game or not’, wouldn’t you say? 2 – Taichi doesn’t like karuta, showing in this chapter. The second thing you wrote (about no one coming to defend Taichi) kinda contradicts your statement about not trying to set off a shipping debate…so I’d really appreciate it if you didn’t try to set one off here, please. thnks for your review again Karice! Wasn’t this a brilliant chapter!! Beautifully drawn, one of those chapters that truely stand out (like the two Taichi confession chapters that also were drawn with so much emotion and heart). Suetsugu san puts so much of herself into this kind of chapter! Suou is still a big mistery to me: is he looking for a successor? Is he stringing a trap for Taichi? Does he want a friend? I’m still not sure about what i think about him: he sure is facisinating: and Taichi is terribly drawn to him……that scene with the moon behind him is profoundly omnious. I can’t help but like the Meijin. 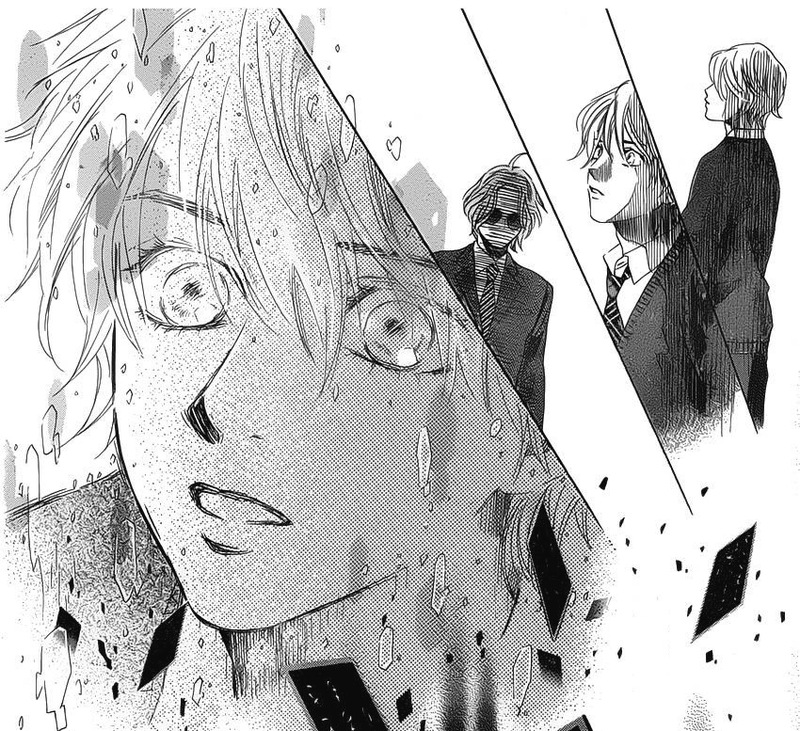 and Taichi admits he doesn’t like karuta……he is enduring for those he loves most……Taichi is always a whirlpool of emotions……and he still will go for it and play karuta……..i just can’t wait to find out what will transpire between these two. Suou is still a big mistery to me: is he looking for a successor? Hm…I’m not sure myself. However, considering that Suou is a tutor, and one who actually does seem to care for his students in his own way, perhaps he’s finally found someone that he knows he can mentor in karuta? There was a time when Suetsugu really got me to dislike Suou, because he was so jaded and rude. So it’s a really good thing that Harada managed to reach him, and somehow spark his interest in the other people in the karuta community. In any case – agreed! I can’t wait to see how this turns out! Great review. And you were afraid that Suetsugu wrote herself into a corner by breaking up Taichi and Chihaya Who knew that Suou could have such a profound influence on Taichi and made him realize that while he hates karuta, he does not hate the people who play karuta. BTW. Chii-chan is the nickname Michiru gave Chihaya in 7th grade in the middle school light novels. Michiru is the only person who has been by Chihaya’s side for the past 6 years. Chihaya ran track partially because Michiru ran track. Well…it was a little disconcerting seeing her post several tweets about writer’s block! I think it’s been obvious since chapter 123 that Taichi’s way forward in karuta was to learn from Suou. The entrance exams are 8 months away though! The regionals are in just one month!! 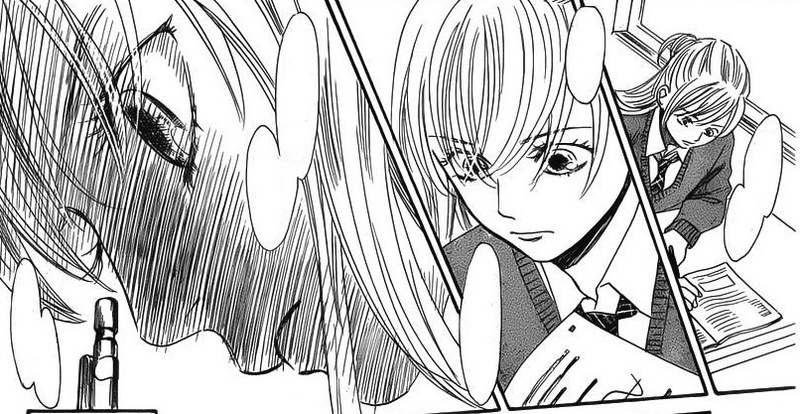 oh i also thought at first that Taichi continued playing karuta to be with Chihaya. i also thought that it’s his way to beat Arata. i guess i just realized how he kind of forced himself to like karuta, and eventually find it interesting, especially playing with Chihaya and the rest of their team. well i do hope he could get sou connected to the community of caruta, just like what you mentioned that Chihaya did with Shinubo. oh.. just realized as well that taichi gets along with the meijin and chihaya is friends with the queen.. that’s a great turn out of events..this could be a long way to go until chihaya can fight against the queen.